On the heels of a recent thread about historical U.S. portfolio disasters, which focused on stock market crashes, several Forum members protested that historical bond disasters hadn't received their just due. As redress, this post looks at the performance of bond-heavy portfolios during the two periods in the last century when U.S. bonds suffered the most — the World War I Inflation Shock and the Progressive Inflation Disaster of 1940-1989. Technical note: In the two charts below, each portfolio's performance is indexed to the pre-crisis bond market peak. All returns are geometric total returns, inflation-adjusted, with dividends reinvested. The two charts are drawn to different scales, with black circles showing the point at which each portfolio permanently regained its pre-crisis real value (assuming no portfolio withdrawals). U.S. inflation rose from 1% in 1915 to 20% by 1918, and stayed above 17% until 1920. Why this massive inflation spike? After the war began, U.S. banks monetized the large quantities of gold that European nations were moving into the U.S., as protection from the conflict and to pay for U.S. exports, since the U.S. was on the gold standard. 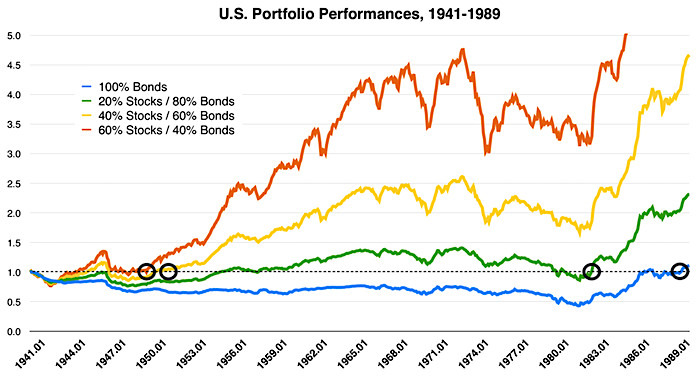 All portfolios suffered (chart below), with bond-heavy portfolios losing 40% of their value and not fully recovering for 10-12 years. After World War II, the 1940s saw high inflation, with spikes of 10%-15% during the decade. 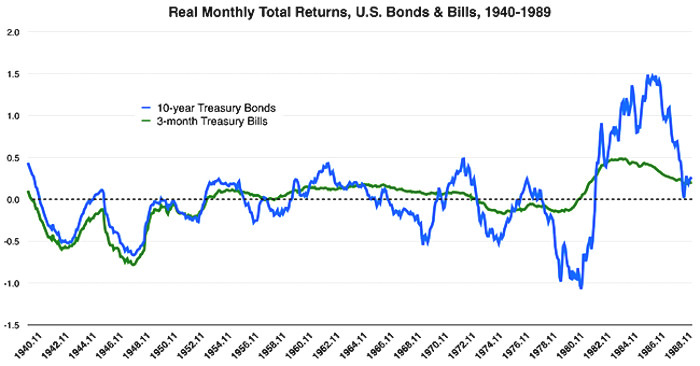 By the early 1950s, bonds had lost 35% of their real value (in blue below) — and did not fully recover for another 40 years! The Oil & Inflation Shocks of the 1970s drove bond values down even further, finally rescued by the dramatic monetary policies of Fed chairman Paul Volker in 1979. Interestingly, even a 20% allocation to stocks would have preserved the capital value of a bond-heavy portfolio over this period (in green below), assuming no portfolio withdrawals. 1) 100% nominal bonds is not a safe portfolio allocation for any long-term investor. Allocating 25%-40% to stocks would likely help preserve real capital values over long holding periods, especially with periodic withdrawals. 2) Allocations to TIPS, short-term bonds and cash would add further portfolio protection against high inflation. Last edited by SimpleGift on Mon Jul 09, 2018 11:48 pm, edited 1 time in total. There could be several definitions, but in the context of this thread, it's assumed that investors with bond-heavy portfolios (60%-100% bonds) are more concerned with capital preservation than the long-term growth of their assets — and capital preservation means real, inflation-adjusted capital value. The OP analysis purposely avoids the issue of safe portfolio withdrawal rates, as that's a complex topic for other threads. Is there a way to tie interest or mortgage rates into this? I believe the last time mortgage rates were at these historical lows was the 1950s or so. Is that something to consider with all this? Good justification for keeping a good stock allocation as opposed to a "safe" very bond heavy portfolio. During the period from the Depression to 1958 stocks yielded more than bonds because investors decided stocks had the greater risks. As you've pointed out in other threads, investor yield is substantially higher than just dividend yield today, so the "dividend decline" is not the warning it is sometimes held to be. Interesting to look at the charts and note that the 60/40 or so Wellington Fund was a good place to be long term starting in 1929 despite the inauspicious start date. I think the historical return Vanguard shows is something like 8% or so last time I looked. In retirement, I'm on the side of stock reduction and holding bonds, but not more than half of my portfolio. Uh, how? What do you have in mind? I'm not really seeing how mortgage rates affect one's portfolio. Or are you suggesting that people should dynamically adjust their bond holdings based on mortgage rates? In other words: what is it you want to consider? My thought is: I am happy with my current approach: 100% stocks. I will consider moving some to Bonds when I reach close to wealth distribution phase of my life. Oh, I'm definitely not suggesting anything. Just wondering if historically low interest and mortgage rates trend with inflation rates soon to rise. Should we expect or consider that is coming? What do we do about it if that is a thing? Well, stick to the plan and stay the course would still be my thinking. I appreciate your endeavor to balance out the stock disasters, but I'm not seeing a lot of discussion of bond duration - if we're talking about intermediate, that's different than long and different than short, which could make a big impact. I don't know what data sources you have available, but rerunning this with T-Bills and/or cash would be helpful, I think (particularly since those have, AFAIK, weathered inflation better). I don't know what data sources you have available, but rerunning this with T-Bills and/or cash would be helpful, I think (particularly since those have, AFAIK, weathered inflation better). Treasury bills didn't really exist before December 10, 1929, so there are limits on what using them can tell us. 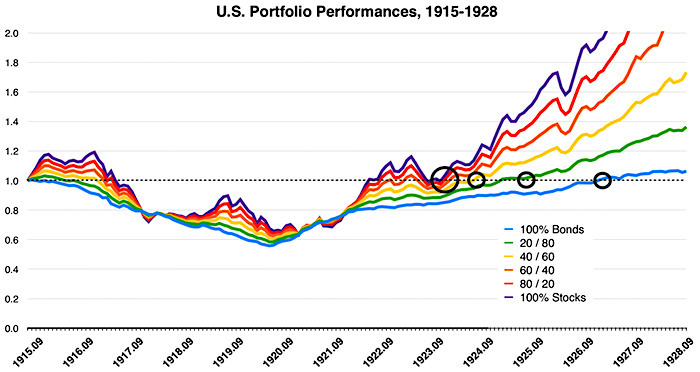 No one would have been able to have them during the October crash of 1929, for instance, and they aren't going to tell you much about the 1915-1928 underperformance noted in SimpleGift's post. The modern Treasury mechanisms didn't really exist before the early 1930s; I don't think retail investors could really buy short-term Treasury debt before then. Even worse, a bond holder during that period of 1915-1928 almost certainly would have not owned short term Treasury debt (or at least not only short term debt). Around 75% of all Treasury debt was held in the form of Liberty Bonds (which were very long term, 20+ years) and there was tremendous social pressure to buy them. To the point of Congressional investigations into possible "pro-German sentiment" when people didn't buy them as expected. How does one even begin to think about modelling that kind of thing? Then there's the additional complication that the US government defaulted on those Liberty Bonds in 1934 and bond holders were never made whole. I think it was something like a 40% haircut that bond holders took. So do you try to include that default as well when looking at bond's performance & safety? You also start get into things like the transaction costs of needing to call your broker in New York every 3 weeks to rollover Treasury debt and whatever he's going to charge you for that. I don't even know how that would have worked back then. Equities have a similar problem but at least there you can hand wave "buy & hold" and pretend it isn't a decisive impact instead of having 300% annual turnover like short-term bonds do. I should note: all of which isn't to say that I find modeling & backtesting useless. I think it is useful -- and you are right that based on the post-1940ish period short-term Treasury debt seemed to hold up well. But when we just look at backtesting numbers it is easy to lose sight of all the nuance and context that real investors would have dealt with. Then there's the additional complication that the US government defaulted on those Liberty Bonds in 1934 and bond holders were never made whole. I think it was something like a 40% haircut that bond holders took. AlohaJoe....I have come to appreciate your posts more and more over time. When I read that, I said to myself, "No way!" Then I looked it up and Lo and Behold, "Yes way". In my reading I found that it was not a case of 'stiffing' bondholders on any payment, this was about arbitrarily changing the terms of redemption. Namely, bondholders were not allowed to redeem for gold (FDR closed the private gold market) which the bond terms specifically allowed for. And they were paid out in devalued dollars, as I understand it. Hence the haircut. Never knew about that. I learned something today. The next time we hear about the debt ceiling thing, which seems to perenially come up, I will now know that there was at least one time we defaulted. My question: How long did it take for our reputation as creditworthy to return? Or did it never really take a hit? Actionability: How can we see the 'signal' that would indicate taking a haircut is a growing possibility? Thanks for doing this follow up to your previous post focused on stock crises, great work! Yes there are always limits to methodology with historical data but the two posts taken together do a great job illustrating why we typically have both stocks and bonds in a long term portfolio. The so called “efficient frontier” method of determining AA has always shown that even the most “conservative” portfolio should have some stock allocation and these two scenarios back that up. My bond allocation is finally getting large enough (75/25) that I need to think more about what all is going to be in there. Presently it is TSP G, a T Rowe SVF and an intermediate treasuries fund. Thinking about whether TIPS should become part of it or whether TSP G and SVF along with the modest duration of the treasury fund are enough inflation protection. Thanks again for doing the analysis and sharing with the forum. Thanks SimpleGift for providing the data and initiating the discussion on this thread and the previous one. I have learned a lot from both. For "bonds" I think the "safety" factor can be improved by using CDs/bonds with a duration <5 years or TIPS. Duration risk is certainly real and assuming your charts are for 10 year treasuries I think they point this out pretty clearly. For now I am mixing 1-5 year CDs with mid-term bond index funds. As far as I know there were no consequences. If anything, the resulting Supreme Court case of Perry vs. United States is seen as evidence in favor of the trustworthiness of US debt. The court found that Congress had acted unconstitutionally by changing the terms of the debt; so future Congresses were unlikely to try it again. Of course, that was small consolation for the bond holders because the Court also found that it was impractical to compensate them for their losses. My understanding is that sovereign defaults often work like that.... With surprisingly few consequences for the default. I remember reading a paper a while back they looked at all defaults in the 20th century and found that they often "got away with it". The authors were unable to offer any good explanations for why the global bond market appeared to act so irrationally. Often it seemed to be a case of "well HE lost money but I won't". My take away is that bonds are for safety until inflation starts getting out of control. I have stayed the course for 30 years but living through the inflation of 70's I will move to cash and or short term bonds when and if inflation starts hitting 3-4% with more coming down the road. There were posts a few months back asking if bonds ever lost money over X number of years. I hope that OP see this thread because at the time no one gave them a response as good as this one. While your post (intentionally) doesn't address safe withdrawal rates and the stock to bond ratio, this is, IMO, the key driver of the "bonds are for safety" Boglehead mantra. And, I think it is still accurate, just not at the (extreme) margins. shows that portfolio depletion over a 30-40 year period at a 4% withdrawal rate is highly likely for extremely bond-heavy portfolios. Even those that tilt 60-40 bond:stock run a much greater chance of depletion than those that run the opposite way. It shouldn't be surprising that periods of very high or very low inflation wreak havoc on bond-heavy portfolios. 3% inflation is the approximate average over the last 80 or so years. I'm not sure I would classify that as "out of control" though of course your views may differ. For the 2 years ending yesterday, Vanguard Intermediate Term Treasury (VFIUX), often characterized here as an even safer alternative to Total Bond Market, is down -3.84% and down almost -10% after taxes and inflation. I don't think something that drops ~10% in real terms over 2 years even remotely qualifies as safe. Huh? The distribution yield is now 2.51%. Of course the NAV goes down as rates go up. If you want inflation protection, that is not the point of this fund. Lumping TIPS in with nominal bond disasters due to inflation crises is an error. Interestingly, even a 20% allocation to stocks would have preserved the capital value of a bond-heavy portfolio over this period (in green below), assuming no portfolio withdrawals. This is what the Academic Research has said, a 20% stock/80% bond portfolio is actually safer than a 100% bond portfolio. Of course, TIPS were not available during this time. Safety is in relation to gut wrenching panics and recessions. You’re quite right that it’s not a happy home in inflationary periods, but that’s what a cash/short bond allocation is for. Last edited by Theoretical on Tue Jul 10, 2018 11:42 am, edited 2 times in total. Note: Chart shows rolling, 3-year monthly returns. The addition of Treasury bills to bond-heavy portfolios would certainly have helped smooth the ride. However, the CAGR of bills was a bit less than bonds for the entire period and, as a result, bills took an extra 4 years to fully recover their real 1940 value. Last edited by SimpleGift on Tue Jul 10, 2018 11:39 am, edited 1 time in total. One note is that ther was a Federalky imposed interest rate cap in the 1940s that deliberately was under inflation. It’s not how bills would have performed without that cap. It’s certainly a risk, but is a confiscatory risk rather than an inherently inflationary one. One note is that ther was a Federally imposed interest rate cap in the 1940s that deliberately was under inflation. It’s not how bills would have performed without that cap. Good point, one that I'd forgotten. Looking up the history of the rate caps, it looks like 3-month Treasury bills were capped at 0.375%, while Treasury bond yields were capped at 2.5%. This is while average annual inflation during the decade of the 1940s was running at 6.0%. Ouch! In short, both Treasury bills and bonds were apparently affected, but bills were harder hit in real terms. "Safe" is a relative term, but I think an allocation bonds (especially of intermediate or short duration) and stocks has displayed less volatility than an all-stock portfolio for most periods. I consider bonds "safe" because of their imperfect correlation to equities when stocks drop sharply. The relative safety of bonds has probably been over-rated since we have exoerienced almost a 40 year period of mostly declining interest rates, from the highest rates in modern history to the lowest. The 30-40 years prior to that, with progressively increasing interest rates, tell a different story. I also question whether low correlation of stock and bond returns can be accepted as a given. Great post, SimpleGift, as usual and these are two great take home lessons. I'd like to add one more consideration which is less effective than these two for protecting the bond portfolio in a rising rate, rising inflationary environment. Shortening average duration. Long bonds get killed in such a situation if it persists. We are always ready and prepared to fight the last war, rarely the next one. 35 years of ever-lowering interest rates and ever-lowering inflation lulled us (who focus on recent memories) into equating bonds with safety and longer duration with higher real returns. The tide has changed now and how long the new tide will go on for is unknown. Clearly however it's a good time to look at one's bond allocation realistically rather than through rose-colored glasses. Have to agree with triceratop here. Certainly high-quality nominal bonds have their place in stock-heavy portfolios, serving as valuable ballast during market meltdowns in most instances. But history has shown that every now and then an acute inflationary shock comes along (e.g., the Oil & Inflation Shocks of the 1970s) that takes down nominal bonds hard, right along with stocks. In these unexpected inflationary shocks, where there's no place else to hide, TIPS would likely do very well, along with cash. Not to promote a hard-and-fast guideline here, but it seems like anyone with more than a 40%-50% allocation to bonds in their portfolio should consider including a healthy dose of TIPS as an insurance policy. I'm curious why you would limit using TIPS to heavy bond allocations only while stating that heavy stock allocations would also get hit. Wouldn't the healthy dose of TIPS be based upon the total bond allocation instead? Do TIPS not add value to a 70/30 split in that situation? My approach is to choose the equity/fixed-income split first, then decide how to allocate both portions -- domestic/international, nominal/inflation-protected, whatever. Even if I have a 90/10 split, I should still be deciding how best to utilize the 10. Bill Bernstein's Deep Risk book summed this up pretty similarly. His suggestion for inflation protection on the equity side was international diversification and a dollop of stocks of commodity producers, while on the fixed income side he suggested TIPS (I would also think I-bonds fit into this category, at least for those at lower wealth levels). I imagine those of us who have a while to retirement are concerned more with protection on the equity side, since in theory we should be holding more equities with a longer horizon, while those closer to retirement would utilize TIPS and I-bonds more to at least keep up with inflation. Interestingly, Bill pointed out that gold was a poor hedge against inflationary crises, but worked very well in deflationary crises, which seems to be the opposite of what you hear cited in most financial articles and media. Do TIPS not add value to a 70/30 split in that situation? Right, but with only a 30% bond allocation, there's a limit to how much portfolio insurance one can achieve by adding TIPS. Nothing wrong with adding TIPS (say up to half of bonds), but their impact on the overall portfolio will be limited. On the other hand, investors with bond-heavy portfolios (50%-100% bonds) are much more exposed overall to inflation risk, both expected and unexpected — and thus TIPS should probably make up a much larger proportion of assets, I believe. I agree entirely with both of your observations. The notion that "bonds are for safety," which is often quoted on this forum, needs clarification. It would probably be more accurate to say that "bonds are for low volatility (compared to stocks)." Even through these rough periods for bonds, they never dropped in real value as precipitously as stocks have (e.g. -50% in a single year). Though I'm a big proponent of TIPS, especially in bond-heavy portfolios, it needs to be said that they're not entirely a risk-free asset. 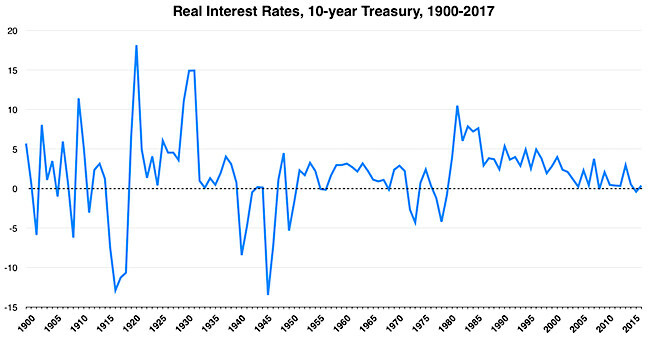 At the longer maturities, they still have considerable interest rates risk — i.e., to changes in real rates (chart below). One solution is to hold individual TIPS bonds to maturity, though some have found this cumbersome outside of a liability matching portfolio. For regular investment portfolios that are heavy in bonds, perhaps the best way to reduce interest rate risk is just to reduce duration, say with a mix of short and intermediate-term TIPS funds. Just a thought. Yes, by bond standards, TIPS are quite volatile. Since 2001, TIPS have outperformed the total bond market by .63% annually but with a standard deviation of 5.98% instead of 3.46%; the Sharpe ratio of TIPS over this period was .61 rather than TBM's .85. That's why I think that you're suggestion that TIPS not represent more than half of one's fixed income allocation is appropriate; if/when you need to sell bonds, you'd rather not be forced to sell TIPS that are currently down in value. Last edited by willthrill81 on Tue Jul 10, 2018 3:18 pm, edited 1 time in total. "Bonds are for Safety" ? There are many different kinds of bonds. Some risky. Some safe. Vanguard's Total Bond Market Index Fund was started by Jack Bogle in December, 1986. It is a very diversified, high-quality, intermediate-term bond index fund that tracks Barclays US Aggregate Bond Index (formerly the Lehman Aggregate Bond Index created in 1976). Jack's invention is now the world's largest bond index fund (with good reasons). The Index had only three negative years (all small) reflecting very low risk. Vanguard Total Bond Market Index Fund worst annual return was -2.6% since inception. In 2008 the S&P 500 Stock Index plunged -38.5%. Bonds are for safety. Stocks are for higher return. Thanks for that and that is what I also understand was the meaning for this specific thread. However I do not think this is a universal definition. The term capital preservation certainly doesn't mean on a real basis but preservation of the actual capital unless further specified. From a portfolio asset allocation model I do not agree that the safety of bonds means to have a real return. Certainly the more return possible is always good but I do not look to bonds to provide return. That is the purpose of stocks. Bonds are for stability, an anchor, stability of principle, low volatility. To me discussing bonds having a real return is just a discussion about bond performance. I don't think there is anything special about bonds having a real return as that is just playing with the duration and risk level. For example, most of my fixed income is in a stable value fund that has zero volatility but at a slightly less return that TBM. To counter this I take risk on the stock side. Re: "Bonds are for Safety" ? I believe that Simple's analysis has demonstrated that that is not entirely accurate. It would be more accurate to say that bonds have been less volatile than stocks, but that's not the same thing as "safe." Losing over 30% of one's purchasing power in less than five years (i.e. intermediate term Treasuries, roughly analogous to TBM, from 1976-1981) is not what most people would call "safe." Even the Vanguard Short-Term Inflation-Protected Securities ETF (VTIP) lost value for several years. That is not to say that they don't have a place in the portfolio -- but they are also not a panacea. I too have a well paying SVF (3.25%) in my 401k, but I currently have no need for it. For reasons that Simple has laid out in this thread, I'm not a big fan of TBM. I think that short-term bonds, T-bills, CDs, and good SVFs are preferable from a 'safe' standpoint. "Take your risk on the equity side." I probably wouldn't place any money into TIPS, regardless of their duration, that I needed in under five years. I didn't know about those caps in the 1940's, thanks. Apparently the cap was lifted around 1952. Maybe this is why some of those Treasury bond series start in the 1953 period. I'm buying Vanguard Tips (VTIP), duration 2.7 years, and Fidelity Tips (FSYIX), duration 5.45, for a duration mix. I also own individual tips and I-bonds bought at the turn of the century. I'm also doing VGSH, Vanguard's two-year treasury ETF, which with my mix of munis in taxable and some below-par preferreds in IRAs, give me a comfy 4 year duration probably. I'm also not comfortable with BND given the six year duration. I figure the treasuries and high quality munis will hold up fairly well in any inflation or market turmoil. I'm aiming as far as I can for pretty liquid holdings that I can move to equities if there is a correction. Otherwise, the 50/50 in retirement gives me all the cash flow I need and I can use RMDs to keep the allocations in balance. Why do you quote bond returns in nominal terms when your data allows you to compute bond returns in real terms? I see a 10% real loss in bonds in a single year. That is significantly more loss than -2.6%. Vanguard Total Bond Market Index Fund worst annual <nominal> return was -2.6% since inception. Instead of proving bonds are safe, this proves how nominal bonds suffer during high inflation. There were some ugly years in the the 1940's, 50's, 60's and early 80s. Look how TBM provided real losses from 1977 to 1981. I would argue that can be very high risk to a retirement portfolio. If anything, look at the huge real losses in 1979 and 1980 from an investment that is supposedly "safe". We are all suffering from recency bias. Yes, if you are used to bonds (and investing) from the mid-1980's, bonds have been your best friend. But, there is no guarantee that the same strategy will work in the future. Also, again, the chart's starting dates are important. They are specifically chosen to illustrate the worst bonds crises. But that's not the end of the story. Whatever strategy one can devise (in hindsight!) to mitigate such specific scenarios (e.g. by using more short-term bonds, cash, etc) would very likely have backfired with other starting years. The bottomline of this series is very simple in my humble opinion. There are severe risks everywhere in investing. There is no 'safe' place, and being parochial is being foolish. Diversification and hedging bets is key to mitigate the best you can. Empirical evidence, as well as reason, shows fixed income is persistently less volatile than equity. Unless you give a precise definition of what you mean by the investment-world useless word safe, your question cannot be answered. 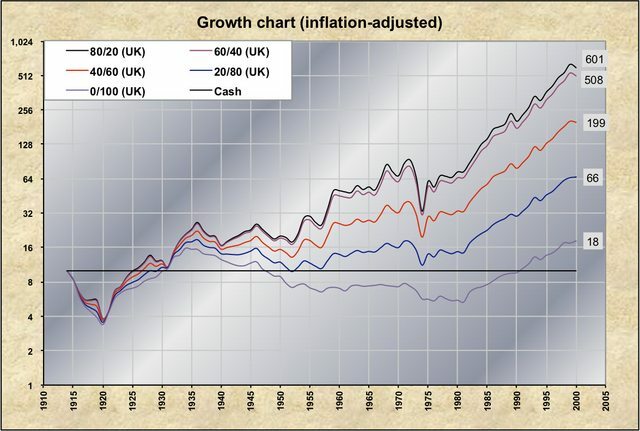 I quickly cobbled together a somewhat similar analysis for the UK, using inflation-adjusted annual returns. Data sources were shared with me by SimpleGift, so I will let him elaborate if needs be. The bonds side of the equation is 50% bills and 50% long-term bonds, because... this is what we have to try to make a rough TBM-equivalent! Note that the vertical scale is logarithmic. You can click (once or twice) on the image to view a bigger version. Squint a bit, and you'll see that after the big hiccup of WW-I (a 50% drop), things really started to go south around 1935. 60+ years to recover the 0/100 portfolio (without any withdrawal, mind you), 50+ years to recover the 20/80 portfolio. I don't have the data handy, but I've been told that France didn't fare much better. Germany is off the charts with the hyper-inflation of the Weimar republic. And in more modern times, Spain and Italy keep fighting inflation to this day.